Thanks to Redsfest this off-season, the Red Hot Family had three vouchers for free tickets to certain Reds games. We had the choice of Tuesday or Wednesday of this week, but since Tuesday was Bring Your Dog to the Game Day, we went with Wednesday. As if 250 dogs on a big concrete slab weren’t bad enough), I also bust out in serious hives when I come in contact with canine drool. Our seats were all the way up at the View Level, which isn’t a short trip. So, we decided to take in some of the lower-level activities before heading up the Forever Ramp to the 500-level seats. After discovering the curly slide was closed (apparently for the rain, though I don’t think riding a slide in the rain is any worse than sitting in your seat in the rain) and that the Smokehouse special for the Giants series was salmon with dill sauce (we were expecting a giant hot dog or jumbo shrimp or something), we decided to take some shelter in the Machine Room Grill. The last time I was in the Machine Room Grille, we got nachos and deep-fried Oreos. Yeah, that’s not happening anymore. The stuff on the menu sounded like normal food, but the descriptions made it clear that it wasn’t. For example, how many times have you had mac and cheese with New York Strip on it? But such lofty Kraft Dinner toppings did at least explain why it cost $9. There seemed little hope of ordering something a kid would actually eat, so we decided to forgo dinner and just get a couple appetizers. We got the “Chips and Salsa,” which were actually pretty good. 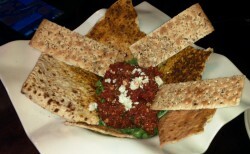 Sun-dried tomatoes and feta cheese on a bed of dandelion greens, served with sesame seed crisps and flat bread. Sounds like all the chips and salsa you’ve ever had, right?? We also ordered the poutine, in solidarity with Joey Votto. Again, it was nothing like the actual dish. 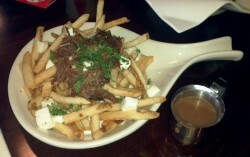 Since when does poutine feature mozzarella cheese and shredded beef? At least they left the French fries alone. In fact, I think putting a gourmet twist on ballpark food classics isn’t a bad idea, but it doesn’t belong within the park itself. It just doesn’t fit alongside the disposable cups of Bud Lite Lime (which you have to order from the “specialty” beer list). Instead, I think this menu would work much better in some rooftop hotel restaurant near the ballbark. There was one “fancy” thing to get excited about: the soft drinks at the Machine Room Grille came with straws. Straws! 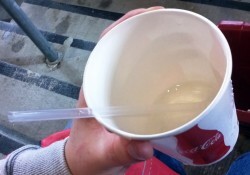 In a ballpark! Imagine that! Most kids don’t really do the whole sun-dried tomatoes and dandelion greens thing, so after our trip to the Machine Room, we had to find some more kid-friendly fare. We made our way to the LaRosa’s over by where the FSN guys are set up and ordered a “Gourmet Pretzel,” which rang up as “Pretzilla” when we checked out. 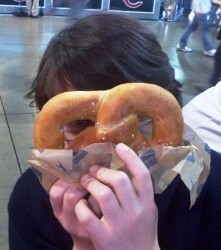 It’s a giant soft pretzel made of pizza dough, and it’s really a meal on its own. I wouldn’t have minded if they offered some pizza sauce alongside the cheese (or better yet, stuff some pepperonis in there) but it was darn tasty as it was. It made me think of the gourmet stuffed pretzels they used to feature at Ed Smith Stadium, back when Reds’ spring training was in Sarasota, FL. I must say: I miss those days. Eventually, we did make it up to our seats, which had a pretty good view if you aren’t too concerned about the heights. No big deal for me: the deathgrip I had on the handrail going up and down the stairs barely gouged out the paint. Not bad for free tickets and a winning night.